Helsinki, the capital of Finland, is a city with a fascinating mix of historical and ultra-modern as well as Scandinavian and Russian influences. Home to many outstanding historical buildings and modern architecture, it was declared the ‘World Design Capital in 2012’. This is quite an expensive city, and that is saying something coming from a Londoner. I absolutely loved attending service in Temppeliaukio Kirkko, a Lutheran church built inside a massive block of natural granite in 1969. The walls are of rock, the ceiling of copper wire and interior lighting is from natural light streaming through 180 vertical glass window panes that connect the dome and the wall. With the rock walls and organ pipes, the acoustics took me to heaven and back. I hadn’t been to church in over a year and I was glad I got to do this and received communion while at it. From Helsinki's harbour, I zipped across the Baltic to Tallinn, the capital of Estonia, on a ferry ride that lasted only 90 minutes. Estonia is the world’s most digitally advanced society – it takes 18 minutes to start a company online and 3 to file a tax return. It was the first country to allow voting online in 2015, declare internet access as a human right and has the most start-up companies per person anywhere in the world. The trip is so easy that Finns routinely visit Tallinn to eat, party, fill up their car trunks with cheap booze, and have relaxing spa and beauty treatments. Getting off the ferry you walk straight to the Roof of Linnahall, built by the Soviets for the 1980 Olympic regatta, it also served as a defence structure in case the Finns attacked the USSR by sea. It has beautiful art painted on the concrete with young people hanging off the wall, drinking beer, listening to music as the sun set beautifully across the water. Tallinn is a beautiful medieval city that looks straight out of a fairy-tale book with its narrow cobblestone alleyways, colourful architecture and hidden courtyards. The Old Town is so charming and well preserved that it has been designated a UNESCO World Heritage Site. Walk the old town, get lost in the alleyways and you could discover, just like I did, the Borsai Passage where the history of Estonia is written on its pavement. To get a view of the old town, walk up the viewpoints on Tompea Hills or have drinks at Radisson Blu's Lounge 24. I really liked Tallinn and had one of my best nights out ever there. It was snowing yet the streets, bars and clubs were packed with happy partygoers and groups of stags and hens (from mostly England). From Tallinn, I headed back to Helsinki to board Princess Anastasia to Russia, the country that at some point had occupied Estonia and Finland and one whose influences are still visible there. 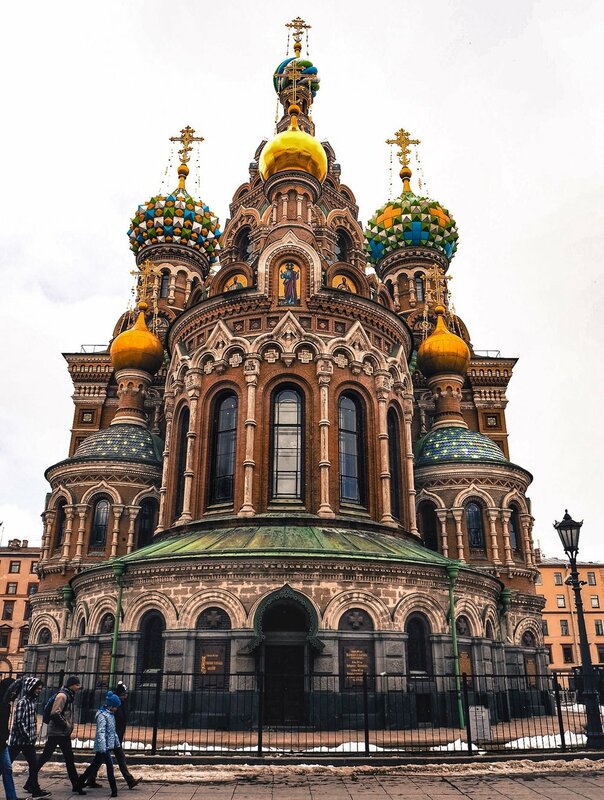 Getting a Russian visa can be expensive and stressful but the kind people of Russia let you visit St Petersburg for up to 72 hours visa-free if you arrive by the St Peter’s Line ferry from Helsinki. So iI jumped on the opportunity to not only visit the country but also to go on a cruise ship. While I enjoyed the live music, video concerts and numerous activities on board, my favourite moment was looking out to the Baltic Sea at dusk while getting a manicure. Once the capital of Russia until 99 years ago, St Petersburg is a city rich in culture and history, and also home to one of the world’s best & largest art museums, The State Hermitage Museum. Of course, you cannot go to Russia and not have Vodka! Walking is the best way to get around SPB as most of the sites are not too far from each other. However, if you’re visiting in winter, wrap up extra warm as it can be crazy cold. I visited in April and everything was frozen. To get your bearing, I suggest going on the Petersburg Free walking tour. I walked an average 11.625km every day of the jaunt and very rarely used taxis or public transport. Besides keeping fit, I believe the best way to get under the skin of small cities especially is by walking. Tip: Most major towns and cities in Europe offer free walking tours where you only need to tip the guide, who are often young people if you really enjoyed the tour. It is a great way to familiarise yourself with the place and quite possibly meet fellow travellers/locals.